Theoretical calculations predict that the Milky Way's central black hole, called Sagittarius A*, will look like this when imaged by the Event Horizon Telescope. 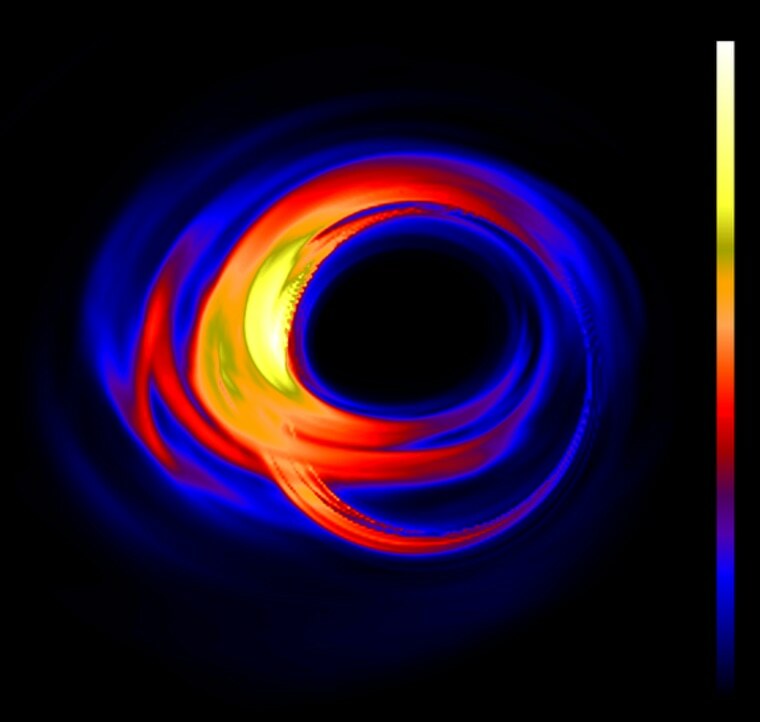 The false-color image shows light radiated by gas swirling around and into a black hole. The dark region in the middle is theDexter, J., Agol, E., Fragile, P.C., McKinney, J.C., 2010, The Astrophysical Journal, 717, 1092. Black holes are essentially invisible, but astronomers are developing technology to image the immediate surroundings of these enigmas like never before. Within a few years, experts say, scientists may have the first-ever picture of the environment around a black hole, and could even spot the theorized "shadow" of a black hole itself. Black holes are hard to see in detail because the large ones are all far away. The closest supermassive black hole is the one thought to inhabit the center of the Milky Way, called Sagittarius A* (pronounced "Sagittarius A-star"), which lies about 26,000 light-years away. This is the first target for an ambitious international project to image a black hole in greater detail than ever before, called the Event Horizon Telescope (EHT). "This is really an unprecedented, unique experiment," said EHT team member Jason Dexter, an astrophysical theorist at the University of California, Berkeley. "It's going to give us more direct information than we've ever had to understand what happens extremely close to black holes. It's very exciting, and this project is really going to come of age and start delivering amazing results in the next few years." From Earth, Sagittarius A* looks about as big as a grapefruit would on the moon. When the Event Horizon Telescope is fully realized, it should be able to resolve details about the size of a golf ball on the moon. That's close enough to see the light emitted by gas as it spirals in toward its doom inside the black hole. To accomplish such fine resolution, the project takes advantage of a technique called very long baseline interferometry (VLBI). In VLBI, a supercomputer acts as a giant telescope lens, in effect. "If you have telescopes around the world you can make a virtual Earth-sized telescope," said Shep Doeleman, an astronomer at MIT's Haystack Observatory in Massachusetts who's leading the Event Horizon Telescope project. "In a typical telescope, light bounces off a precisely curved surface and all the light gets focused into a focal plane. The way VLBI works is, we have to freeze the light, capture it, record it perfectly faithfully on the recording system, then shift the data back to a central supercomputer, which compares the light from California and Hawaii and the other locations, and synthesizes it. The lens becomes a supercomputer here at MIT." A major improvement to the Event Horizon Telescope's imaging ability will come when the 64 radio dishes of the ALMA (Atacama Large Millimeter/submillimeter Array) observatory in Chile join the project in the next few years. Very long baseline interferometry has been used for about 50 years, but never before at such a high frequency, or short wavelength, of light. This short-wavelength light is what's needed to achieve the angular resolution required to measure and image black holes. Pulling off the Event Horizon Telescope has been a grand technical challenge on many fronts. To coordinate the observations of so many telescopes spread out around the world, scientists have needed to harness specialized computing algorithms, not to mention powerful supercomputers. Plus, to accommodate the time difference between the various stations, extremely accurate clocks are needed. The researchers have been using atomic clocks made of what's called hydrogen masers to keep time to an accuracy of about a trillionth of a second per second. "We use this property of the structure of the hydrogen atom to create a fundamental time reference for us that transitions between two states of the electron in a hydrogen atom," Marrone said. "It creates a low-frequency signal that through careful design you can make a very precise oscillator. It creates very perfect oscillations for a short time period. That means we can average our data over those time periods because they will all have kept time very perfectly." With the unprecedented data soon to be collected by the Event Horizon Telescope, scientists are hoping to better understand the strange physics of black holes, which are some of the most extreme, bizarre objects in the universe. The black hole at the center of the Milky Way is thought to contain the mass of about 4 million suns, all packed into an incomprehensibly small area. The ultra-strong densities there should produce some very extreme gravitational forces that offer a rare test of Einstein's general theory of relativity. "The Event Horizon Telescope is going to look at emission at the edge of the black hole itself," Doeleman said. "That's an area where the gravity is so strong that light is bent and the structures you see are dominated by strong gravity, where you absolutely need Einstein to understand what you're seeing. It becomes a laboratory of extremes." One question scientists hope to answer is whether black holes really have event horizons, as predicted by general relativity. An event horizon is a theorized boundary around a black hole that marks the "point of no return" where matter and even light can't escape. If event horizons exist, general relativity also predicts black holes will have shadows, or darkened regions where light has been swallowed. If black holes do produce shadows, the Event Horizon Telescope should be able to see one at Sagittarius A* within the next few years, said Dexter, the University of California, Berkeley, theorist. "That would be the most extreme general relativistic effect detected so far," he added. While the Event Horizon Telescope is observing black holes in radio wavelengths, the other frontier of black hole astronomy is in the X-ray regime. The gas falling into black holes emits light across the electromagnetic spectrum, but the hottest, most energetic gas, which is swirling closest to a black hole's event horizon, can be seen in X-ray light. This light is only visible beyond the atmosphere of Earth, to space telescopes such as NASA's Chandra observatory and NuSTAR telescope, Europe's XMM Newton observatory, and Japan's Suzaku telescope. These observations aren't directly imaging the environs of black holes, like the Event Horizon Telescope, but are breaking up X-ray light into its constituent colors, or wavelengths, to search for clues about what's happening to the gas in those extreme environments. For example, astronomer Chris Reynolds of the University of Maryland, College Park, uses X-ray observations to study the spins of black holes. "Because the physics is so extreme, when a black hole spins, it actually twists up the space-time around it and we can see the effect it has on gas orbiting the black hole," Reynolds said. And by studying black holes in various wavelengths, researchers hope to build up a more complete understanding of these strange cosmic objects. "The gas, as it falls into a black hole, emits radio waves, which is what the Event Horizon Telescope is trying to see, and it also makes X-rays, and that gives you very complementary views on the properties of the infalling gas and the black hole," Reynolds said. "The Event Horizon Telescope is on the threshold of some extremely close results, and we're all looking forward to it."